Just five days before the United Nations Human Rights Council subjects the state of Cuba to its quadrennial Universal Periodic Review there is a profound disconnect between the reality suffered by Cubans on the island and the propaganda offensive underway internationally. There has been an effort to portray the Cuban government as engaging in reforms and doing something different that it has done over the past 54 years. Cuban dissident leaders have called it cosmetic and fraudulent. Some observers point to a handful of dissidents finally being able to travel outside of Cuba after having been denied their right to travel on numerous occasions. 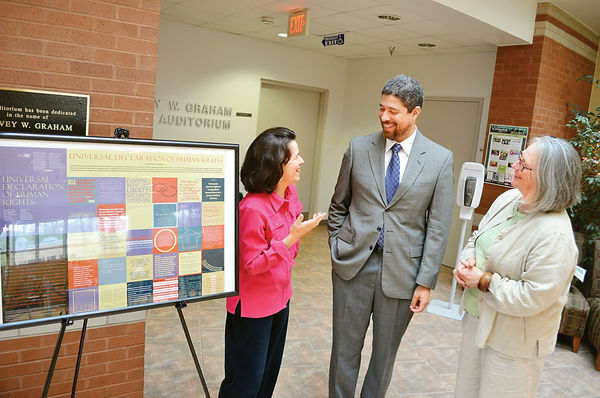 Three who are regularly cited are Rosa Maria Payá, Berta Soler, and Yoani Sanchez. All had their right to travel systematically denied in recent years, but in the case of Rosa Maria Paya and Yoani Sanchez both had traveled outside of Cuba and returned home years ago. Opposition leader Oswaldo Payá Sardiñas, Rosa Maria's father - who died under suspicious circumstances on July 22, 2012 - traveled outside of Cuba in December of 2002 to accept the Sakharov Prize for Freedom of Thought from the European Union. Other Cuban dissidents in prior years had been allowed to travel at specific moments were it served the dictatorship's interests. The same holds true now. This is part of an international charm offensive, but the brutal nature of the dictatorship remains intact. Witness the plight of Yris Tamara Pérez Aguilera. Placetas, Cuba, April 26, 2013. Yris Tamara Pérez Aguilera, president of the Rosa Parks Women's Movement for Civil Rights was again beaten and arrested twice on April 25, 2013 when she left to find medicines on her way to the pharmacy in Placetas, Villa Clara. "My name is Yris Tamara Pérez Aguilera, activist for the Rosa Parks Civil Rights Movement. This April 25, 2013 I was arrested for the second time while trying to get to the pharmacy here, "Rafael", to buy the medicines that the doctor on call had prescribed for me, as I was with the pressure at 150/90. I was arrested and taken to the police station, by the police officer "Acaena" who on the first occasion I was arrested hit me hard on the head. --I am wearing a brace--; She beat me through the brace and on the head. They kept me there in front of the cell for fifteen to twenty minutes,” reported Yris. 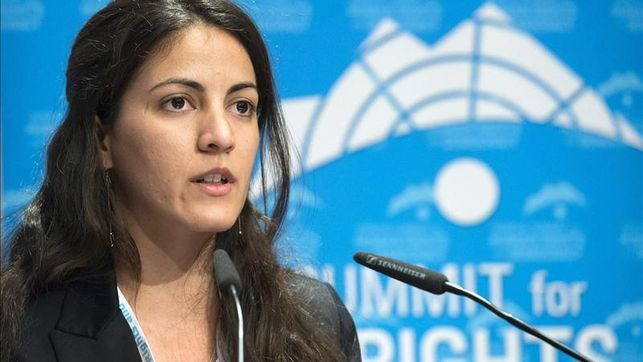 The activist continued her statement alerting that Cuban State Security prevents her from leaving home and that she does not accept her home "as a dungeon" and indicated that she would leave again. “I told the head of the police station, Raul Asari, that I would go out again, and that they should leave me in the police station because I was going to head back out to get my medicines. I am not going to let them try to blackmail me because I feel that I am a free citizen and there is no court order that says that I cannot leave my house," she concluded. Below is the recording from April 25, 2013 from which the above transcription was taken. 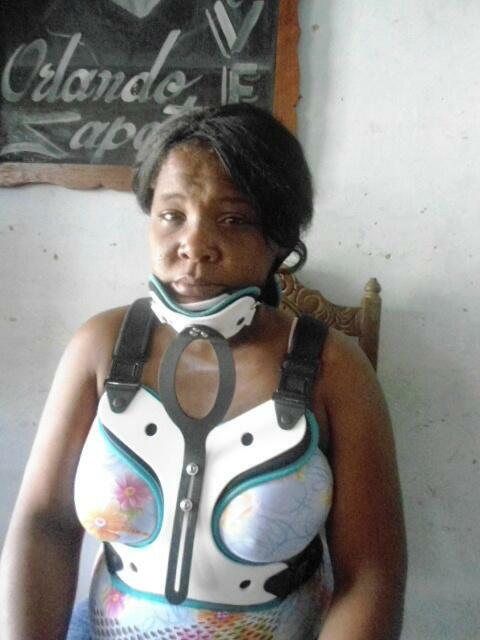 Furthermore, the violence visited on Yris is not unique there have been other women who have suffered physical brutality at the hands of Cuban government agents over the past four years and especially over the past few months. 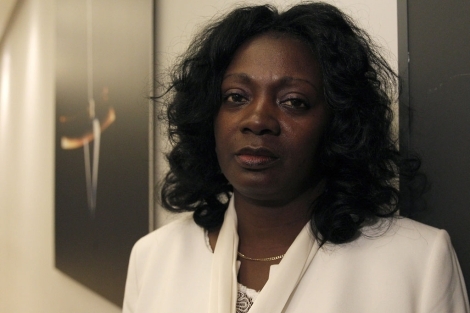 Rosa Maria Payá Acevedo has returned to Cuba with death threats against her and her family and official publications threatening her with prison for demanding an investigation into her father's death. Nonviolent activists have died under suspicious circumstances while others have been savagely beaten. To ignore this reality is to invite more and worse violence against Cuba's nonviolent civic movement. Ladies in White and their spokeswoman Berta Soler held vigil for Cuban martyrs this late afternoon in Merrick Park in Coral Gables. Above are some pictures from the vigil and below videos from the event. Berta Soler in Miami! Join her and the exile community in a vigil in honor of the memory of Laura Pollán and other Cuban martyrs on Saturday, April 27 at 5:30pm in Merrick Park located at Le Jeune Rd & Miracle Mile in front of Coral Gables City Hall. Learn how she inspired me. The inspiration that led to a violent mob being successfully confronted by a minority who held the moral high ground in San Jose, Costa Rica on November 16, 2004 came from inside of Cuba a little over a month earlier. On Tuesday, October 5, Berta Soler Fernandez delivered a letter addressed to Fidel Castro describing her husband’s (Angel Moya's) plight to the government offices behind the Jose Marti monument in Revolution Square. Later that same day, joined by five other wives of Cuban prisoners of conscience, she went again, this time prepared with food, water, and blankets. Berta then declared to international media: "I am going to wait here until I see my husband with my own eyes or I get arrested." Later, despite a massive paramilitary operation, her primary demand was met. Seven years later, following a sustained nonviolent campaign by the Berta Soler and the Ladies in White, Angel Moya was released. Non-cooperation is the use of force, albeit non-violent to effect profound change. Gene Sharp’s analysis of Gandhian non-cooperation is that “the primary motive of non-co-operation is self-purification by withdrawing co-operation from an unrighteous and unrepentant Government. Then, the secondary objective is to rid oneself of the feeling of helplessness thus being independent of all Government control.” In her campaign against the Cuban government, Berta had the high moral ground combined with the courage and discipline not to participate in the injustice being done to her husband. Berta Soler was willing to take action. This had both important external and internal effects. I believe that the internal effect had a greater impact on the final external impact. Internal effects here are defined as effects upon the soul or spirit of the activist while the external effects are the manner in which her action led other activists to respond in solidarity with her, and the regime to react (either negatively or positively to her demands). The Christian tradition speaks of original sin and the Roman stoics spoke of the inner conflicts between the moral purpose and the will. In all cases the struggle to resist evil and to do good is constant and throughout a lifetime there are victories and defeats regardless of which one chooses to embrace. No one is purely evil or purely good. Nevertheless, refusing to cooperate with evil -- engaging in non-co-operation -- is a method of self purification that also raises moral forces in the practitioner giving greater reserves to challenge an unjust adversary. This provides the context in which the series of events that created a nonviolent confrontation in the Legislative Assembly of San Jose, Costa Rica. Costa Rican members of the International Committee for Democracy in Cuba led by former president Luis Alberto Monge invited other Latin American and European leaders as well as representatives of civil society to hold an “International Forum for Democracy in Cuba” on the eve of the Ibero-American Summit. The Legislative Assembly is open to the public to reserve rooms, and organize forums and information sessions. The organizers of the forum followed all the appropriate protocols and filled out the appropriate forms, and were given the space. This was all done openly and without any subterfuge. The Cuban government learned ahead of time on November 9, 2004 that the event was being planned and attempted through diplomatic channels to have the event suspended, even before it started, accusing the participants of being: CIA agents, terrorists, and servants of the North American government, and requesting that Costa Rican authorities inform them of the steps taken to cancel the event. When Costa Rica, a bastion of democracy and civil liberties in the Americas refused to suspend the event on November 10, 2004 the Costa Rican consul was called to the Cuban Ministry of Foreign Relations and once again the Cuban government demanded that the Costa Rican government cancel the event. Diplomatic notes were sent shortly afterwards on November 11 and November 12 with the aim of canceling the forum. Having failed to stop the event the Cuban government sought to organize an act of repudiation inside the Legislative Assembly. Costa Rica being an open and democratic society with a long history of tolerance and pluralism and the ability to engage in civilized debate all of its governing institutions are open to the public. The Cuban counsel, and high ranking intelligence officer, Rafael Dausá Céspedes utilized groups with ideological affinities with the Cuban revolution in Costa Rica to physically storm the event and use physical intimidation and threats of violence to shut it down after it had started. Six activists including the vice-president of the Czech Senate, Jan Ruml began a “sit-in” to protest the actions of the mob. They refused to depart the room under a threat of violence. One of the six held up a picture of the “Ladies in White” throughout the sit in. This led to a two and a half hour stand off by six activists against a mob of sixty. Meanwhile in another part of the same building the event went off without a hitch, because the sixty did not want to surrender the room to the six. How was this possible? What happened? The answers are simple. This is possible because those few who engaged in the sit-in made a specific demand. They refused to leave the room under a threat of violence. They were willing to risk their lives to defend their right not to be threatened or assaulted by a mob. The sit in placed a handful of participants at the mercy of a mob of sixty. National and international media were present in the room to document the behavior of both sides in the confrontation. The sit-in participants were willing to negotiate to achieve their goal and as the minutes stretched out into hours the mob of sixty not as disciplined began to leave forcing the organizers of the mob to negotiate. After more than two and a half hours (at the time the Legislative Assembly was due to close) Costa Rican officials, still fearful of violence from the mob, carried out the non-violent protesters engaged in the sit-in bringing an end to the stand off. The Costa Rican public and press criticized the government for not removing the violent mob, and viewed the action of the mob with justly harsh criticism. The six engaged in a non-violent sit-in to protest the violation of their right to free assembly, free speech and freedom from intimidation held the moral high ground and won the day. All of this was made possible by Berta Soler, whose example, taking action to save her husband against incredible odds but with great moral courage inspired another act of resistance 918 miles away in the face of another mob organized by agents of the Cuban government. One of the benefits of a nonviolent moral stand is that it is a positive example that inspires others and leaves a positive impact that often times cannot be measured or predicted. across the street from Coral Gables City Hall, at the intersection of Le Jeune Road and Coral Way (Miracle Mile). From 836: exit Le Jeune Road, travel south to Miracle Mile. Today marks nine months since Oswaldo Payá and Harold Cepero died in a suspicious car crash that appears to have been provoked by state security. It also marks six days since Rosa María Payá Acevedo returned home to her home and family in Havana, Cuba on April 16, 2013. She'd finally been able to travel outside of Cuba, after having been refused the opportunity to study in Chile in January of 2013, on February 16, 2013. It was not her first time outside of Cuba; she had been permitted to visit family in Spain and also visited Rome, and Poland back in 2008. Over the course of two months she traveled through Europe and the United States to pursue justice for her father and Harold. In the meantime back home the death threats began to arrive at her family's home as had also been done against her father when he was alive. 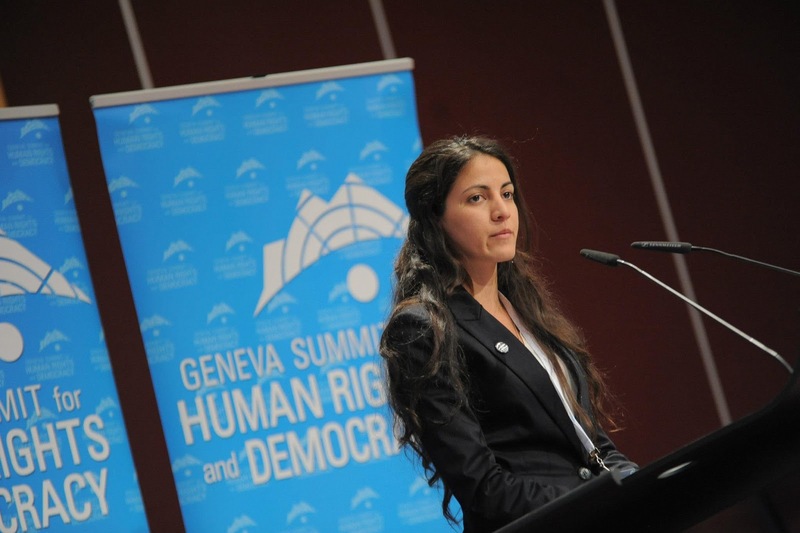 On the same day that she spoke for the first time at the Geneva Summit for Human Rights on February 19, 2013 another member of the Christian Liberation Movement, Antonio Rodríguez, died in another car crash was it just a coincidence or a message? People of good will inside and outside of Cuba need to keep an eye on the plight of the Payá family and support their call for an international investigation into the deaths of these two courageous activists. In the meantime let us also pray for the safety of Rosa Maria, her mother Ofelia and her younger brother Reinaldo Isaías as well as the members of the Christian Liberation Movement who remain in Cuba speaking truth to power and seeking justice for Oswaldo and Harold. The human rights situation in Cuba is dismal and thousands of Cubans have died either trying to flee the dictatorship or attempting to bring an end to the communist regime. Courageous men such as Jorge Luis Garcia Perez "Antunez" who openly declared in a public space in 1990 that Cuba needed to undergo reforms like those taking place in Eastern Europe would find themselves imprisoned for oral enemy propaganda and in Antunez's case would spend the next 17 years in prison. He emerged from prison in 2007 and has continued his nonviolent struggle for change in Cuba. His wife, Yris Perez Aguilera, has been repeatedly attacked and struck in the head leading to the development of a large cyst and the back of her head and other troubling symptoms that have not been addressed by medical professionals due to the interference of state security. When Cubans have risen up in large numbers they have been met both with force and on some occasions with the option of escape as was the case in 1980 with Mariel and during the 1994 rafter crisis. Both migration events were due to large protests that threatened the regime. In 1980, 10,000 Cubans stormed and occupied the Peruvian embassy in Havana and on August 5, 1994 thousands of Cubans took to the streets of Havana chanting freedom. Many of the demonstrators, who did not escape into the sea aboard rafts, were filmed by state security agents and later beaten and detained. These are the exceptions not the rule. At other times the Cuban state security apparatus has used sand bags, snipers, and other vessels to attack and massacre rafters, defenseless swimmers, and Cubans fleeing on other vessels to a life in freedom. One well documented example is the July 13, 1994 tugboat sinking in which 37 men, women and children were massacred by Cuban government agents. At the same time Cubans living abroad are also restricted from returning to their homeland. As many as 300,000 are banned from returning and those who do are subjected to more restrictions than non-Cubans. That is not to say that non-Cubans do not face danger visiting the island. Two cases dramatize the dangers of visiting a state that does not have the rule of law. Joachim Løvschall, a Danish student studying Spanish at the University of Havana gunned down by an AK-47 wielding Cuban guard as he walked home on the evening of March 29,1997. The body remained hidden for days. The shooter was never identified. Secondly, is the case of Alan Gross, an American citizen, he was arrested on December 3, 2009. His "crime" attempting to provide uncensored internet access to a local Jewish community in Cuba. He was sentenced to 15 years in prison in a show trial. He has lost 100 pounds during his captivity. Often times when someone asks "How have the Castro brothers remained in power for more than half a century?" the questioner is also implicitly asking: "What are Cubans doing to obtain their freedom?" Both questions are legitimate. One must recall that Cuba is not only a totalitarian dictatorship but the original generation of brutal dictators are still hanging on to power. The Soviet Union held on to power for 74 years and Communist China's dictatorship is still in power after 64 years this coming October 1. The communist dictatorship in North Korea run by one family has been in power since September 9, 1948. This type of system tends to stay in power and is difficult to dislodge. In the case of Cuba, the Castro brothers have been in power since January 1, 1959. The struggle against communist regimes typically involves two phases. The first an armed uprising as was the case in Poland in 1944, in Hungary in 1956, and throughout most of Eastern Europe. The same holds true for Cuba between 1959 and 1965 there were armed partisans, many of them farmers, up in the mountains of the Escambray who were killed. The Castro regime called it the "war against the bandits." The second phase is nonviolent and involves human rights activism, the emergence of alternative social institutions and independent civil society. In Poland it was the Solidarity movement, and in Czechoslovakia it was the Velvet Revolution and in Estonia it was the "Singing Revolution." Although the collapse of these regimes occurred quickly in the media cycle; the actual opposition dynamics took years and decades. This type of nonviolent movement has also been underway in Cuba for some time. For example, the Christian Liberation Movement was founded in 1988 by lay Catholics at their local parish in Havana in the neighborhood of the Cerro. Oswaldo Payá Sardiñas was the chief spokesman of the movement and the chief strategist behind initiatives such as the Varela Project, the Heredia Project and the Peoples Path. The Varela Project, named after a 19th Century Cuban priest, sought to reform the Cuban legal system working within its own laws via referendum. According to Article 88(g) of the Cuban Constitution Cubans can push through a legislative initiative via a petition with 10,000 signatures. In May of 2002 Oswaldo Payá along with Regis Iglesias Ramirez, Tony Diaz Sanchez and others turned in 11,020 signatures to the rubber stamp Cuban National Assembly. The Cuban government's response was to organize its own mandatory petition drive to make the Cuban Constitution "unchangeable" and on March 18, 2003 it launched the Cuban Black Spring rounding up 100 activists and sentencing 75 of them to long prison terms of up to 28 years in prison. The dictatorship thought that this draconian response along with the execution of 3 young Afro-Cubans who had tried to hijack a ferry out of Cuba would shut down dissent. They thought wrong. Within days of the crackdown the mothers, wives, sisters, and daughters of the 75 activists formed the Ladies in White. Meeting on Sundays they would go to Mass at the Catholic Church and then march silently carrying white gladioli demanding that their loved ones be freed. They would also hold literary teas at the home of the chief spokeswoman of the movement, Laura Pollán, a former school teacher. Ten years later they are still marching, their loved ones now out of prison, they continue to walk demanding that all political prisoners be freed and the laws changed so that new ones not replace them. The leaders of the nonviolent civic resistance movement have paid the ultimate price in their struggle for freedom. Laura Pollán after years of suffering beatings, a fracture, injections from government mobs, became ill and in the space of a week died on October 14, 2011. A Cuban dissident doctor who examined her treatment described it as "purposeful medical neglect." Oswaldo Payá Sardiñas and the youth leader of his movement, Harold Cepero, both died in a car crash under suspicious circumstances on July 22, 2012. The Payá family has called for an international investigation into the deaths of both Oswaldo and Harold. Rosa María Payá, Oswaldo's daughter, traveled to the United Nations Human Rights council and requested an international inquiry into her father's and Harold's deaths only to be interrupted by the Cuban government and a who's who of the worse human rights violators on the planet: Belarus, China, Nicaragua, Russia, and Pakistan. Berta Soler is the new spokeswoman for the Ladies in White and upon arriving in Spain denounced Laura Pollán's suspicious death along with Oswaldo's and called for the freedom of all political prisoners. 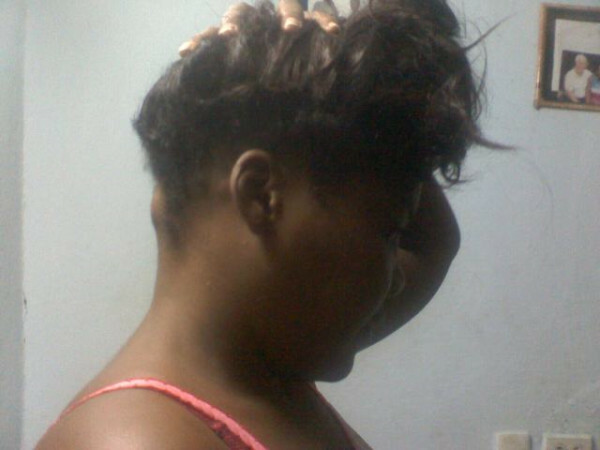 Meanwhile in Cuba arbitrary detentions are on the rise and women are being physically brutalized by government agents. A fifteen year old girl was repeatedly knifed and scarred for life for defending the Ladies in White in November 2012 and needed 66 stitches to seal up her wounds. A sixty year old lady, who is a member of the Ladies in White, was repeatedly struck in the head with a blunt object and needed more than 30 stitches. 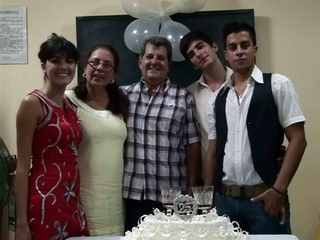 The Payá family has received death threats at their home. Cubans need you to keep your eyes on what is happening in Cuba and to demonstrate your solidarity with these courageous human rights defenders. Their lives and the future of a free Cuba may depend on it. "Injustice anywhere is a threat to justice everywhere." - Rev. Martin Luther King Jr. While discussing the human rights situation in Cuba and the totalitarian regime that has ruled over the island for the past 54 years it is also important to mention its impact on human rights and political stability outside of the island. The Cuban government has had close relationships with major international drug traffickers and Cuba has served as a transhipment point to the United States. During the Vietnam War, the Cuban government sent advisers to Vietnam who tortured U.S. prisoners of war between 1967 and 1969 in what became known as The Cuban Program in an effort to demonstrate to the Vietnamese how to most effectively break the will of American soldiers. The Cuban government also engaged in actions in Africa with close allies who have been tried in absentia for genocide and found guilty such as Ethiopia's Mengistu Haile Mariam in a slaughter in which the Castro brothers were also complicit. On March 1, 1982 the Cuban dictatorship was placed on the list of state sponsors of terrorism less than three months after the US State Department confirmed that the Castro regime was using a narcotics ring to funnel both arms and cash to the Colombian M19 terrorist group then battling to overthrow Colombia’s democratic government. Unfortunately, there is plenty of evidence that demonstrates that as early as the 1960s and up to the present date that the dictatorship in Cuba has been and remains a state sponsor of terrorism. International terrorists such as Carlos the Jackal were not only inspired by Fidel Castro but also trained by Cuban government agents and later defended by close allies such as Hugo Chavez. The Cuban government's state security service in addition to monitoring and terrorizing Cubans in the island has also been successful overseas in penetrating U.S. intelligence agencies, the State Department, and has spied on U.S. military installations. Ana Belen Montes was a high ranking analyst for the Defense Intelligence Agency, the military version of the CIA, who drafted the report that provided an assessment of the threat that Cuba poises to the United States. She also had access to intelligence on Latin America that she passed along to her Cuban handlers that led to the death of at least one American on March 31, 1987 and his name was Gregory A. Fronius. The FBI arrested her on September 20, 2001 before they could identify and capture her Cuban handlers because in the aftermath of the September 11, 2001 terrorist attacks they feared that the intelligence that she would provide Cuba could end up in the hands of the Taliban or Al Qaeda. Montes had been a spy for the Cuban government since 1984. She had drawn attention to herself during the February 24, 1996 Brothers to the Rescue shootdown and that prompted the investigation that led to her downfall. Walter Kendall Myers and his wife Gwendolyn spent thirty years spying against the United States for Fidel Castro. Kendall Myers was a high-ranking analyst for the U.S. State Department with top-secret clearance who had been recruited in 1978 by Cuban intelligence. His wife would pass her husband's acquired information on to their Cuban contacts. Kendall Myers was found guilty and sentenced to life in prison and his wife got a shorter sentence. The CIA's first defector was Philip Agee who died in Cuba in 2008 at the age of 72. He had defected to Cuba in 1973 and made public the identity of 250 alleged CIA officers and agents. It was the Cubans and not the KGB who had successfully recruited him. The Cuban government infiltrated a network of spies into the United States that it called the WASP network with the objective of spying on U.S. military installations, spying on Cuban exiles, identifying locations to store weapons and explosives on U.S. territory and planned to first terrorize then assassinate a man they identified as a CIA agent living in Bal Harbour, Florida using a mail bomb. They had a role in the February 24, 1996 shoot down and the head of the spy network was found guilty of conspiracy to commit murder for his role in the death of the four men who had been killed. Despite this repressive machinery there are Cubans who nonviolently and in a transparent manner have confronted this brutal dictatorship and are risking their lives today for a free Cuba tomorrow. Cubans engaged in two protracted wars of independence. The first was the 10 years war that took place between 1868 and 1878 and the second took place between 1895 and 1898 ending with U.S. intervention and a 4-year occupation that ended on May 20, 1902. The Bacardi family, began their world famous Rum business in Santiago de Cuba in 1862. Don Facundo Bacardí Massó founded Bacardi Limited on February 4, 1862. The family would also play an important role in civic life in Cuba, especially Santiago over the next century, and were constant opponents of dictatorship, political corruption and remained ardent Cuban nationalists over several generations. Between 1902 and 1952 Cuba progressed socially and economically but faced challenges on the political front. For example in the late 1920s Gerardo Machado, the democratically elected president did not want to leave power becoming a dictator. He was driven from office in 1933 in a revolution led by university students and enlisted men in what became known as the sergeants revolt. This put Fulgencio Batista into the national spotlight and by 1934 he was the strong man behind the scenes even though democratic formalities were restored. Within days of the 1952 presidential elections, Fulgencio Batista organized a coup against the last democratically elected president. Upon Batista’s departure from Cuba on December 31, 1958, Fidel Castro began his triumphal trek across Cuba to Havana where he began to consolidate power while continuing publicly to claim that he was a democrat but privately began to infiltrate his movement with communists, alienating many who had fought with him, and began to approach the mass media threatening them with violence if they reported anything critical. As the months passed all independent media were taken over. Mass televised executions imposed fear in the populace and the failure of the Bay of Pigs in 1961 consolidated his power. It is important to recall that during the 1962 Cuban Missile Crisis Fidel Castro advocated for a nuclear first strike on the United States and was disappointed when the United States and the Soviet Union reached a peaceful accommodation. Twenty years later in the early 1980s, Fidel Castro again asked the Soviet Union to launch a nuclear first strike on the United States. On the second occasion the Soviet officials rebuffed the Cuban revolutionary's request. This led to a chilling in relations between Cuba and the USSR which led to Fidel Castro seeking out training from former Waffen SS and arms shipments from German right wing extremists. 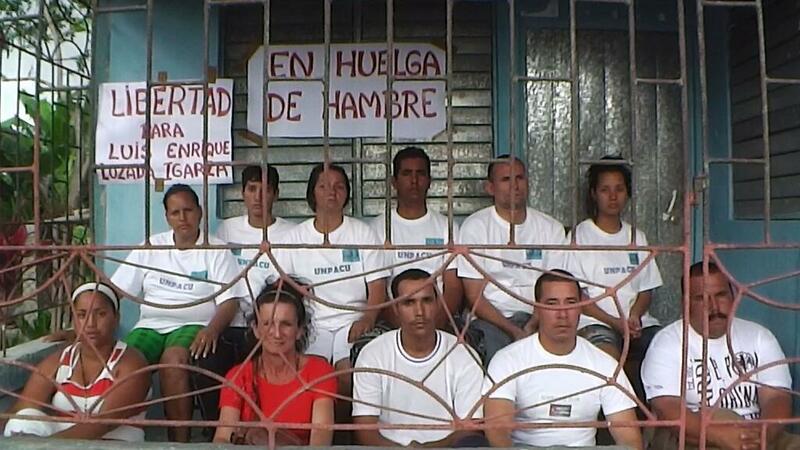 The Cuban government has learned from the best of the worse human rights violators. Between 1959 and the late 1960s, many of Castro's former comrades in arms again took to the mountains to fight the new dictatorship as they had Fulgencio Batista in the 1950s. Many of them were in the Escambray region and most were slaughtered and buried in mass graves or imprisoned for decades in Cuban prisons. The armed resistance to the Castro regime was either dead, in prison, or in exile by 1970. The next phase of the opposition emerged within the prisons on January 28, 1976 with the founding of the Cuban Committee for Human Rights. Inspired by the Helsinki Accords, Eastern European Dissidents and the U.S. civil rights movement it was nonviolent. The leading spokesperson in Cuba was Ricardo Bofill. In the early 1980s many of the activists had been released from prison and continued to denounce human rights violations in Cuba and those reports made there way to the United Nations Human Rights Commission. By the late 1980s with a former Cuban prisoner of conscience, Armando Valladares, now Ambassador to the United Nations for the United States the dictatorship of Cuba was brought under scrutiny at the United Nations Human Rights Commission. This led to the dictatorship accepting the first and only visits by the International Red Cross and the United Nations Human Rights Commission. The reports produced exposed the systematic human rights violations in Cuba. A total of 26 member of the Patriotic Union of Cuba (UNPACU), among them one of its leaders, former political prisoner Jose Daniel Ferrer Garcia, remain on hunger strike as a civic protest against the growing number of violent detentions of human rights activists and the increase of political prisoners. As of now, all the strikers hail from the Eastern region of the country. 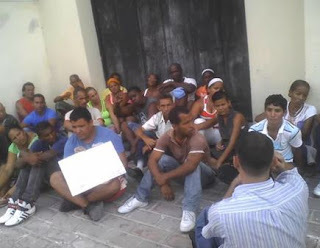 The protest originated on Monday, April 15th, when a group of about 14 activists stood outside the Third Police Unit of Santiago de Cuba, demanding the release of dissident Luis Enrique Lozada, of UNPACU, who has been detained and on hunger strike in the mentioned unit since Tuesday, April 9th. His underage son, Enrique Lozada, as well as other relatives and brothers-in-struggle decided to carry out their own hunger strikes in solidarity. During the night of the 16th, monsignor Dionisio Garcia Ibanez, of Santiago, personally told Jose Daniel Ferrer that he would intercede for them, so that the political detainees, like Luis Enrique Lozada, be liberated. This 18th of April the UNPACU strikers are as follows: 11 in Palmarito de Cauto, 6 in San Luis and 9 in Santiago de Cuba, with a total of 26. Meanwhile, on Twitter the young activist Anyer Antonio Blanco Rodriguez created the hashtag #huelgadehambreUNPACU (“hungerstrikeUNPACU”) to demonstrate solidarity with those carrying out the protest and the political prisoners. Blanco Rodriguez also published various messages informing that in diverse regions of the island there have been signs appearing with messages in favor of the strikers, while many public protests have been carried out, also in solidarity with the 26 dissidents which have put their own lives at risk for the freedom of others. 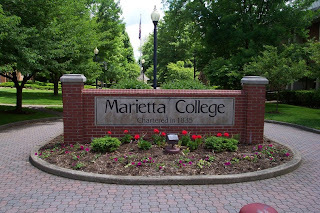 The following text was translated from Rosa Maria's website. My struggle is civic. It is for the rights of all Cubans, a human issue rather than politics. The message of the Christian Liberation Movement, which is mine, is born of dialogue with people. Our proposals have the support of thousands of citizens, but there are many who disagree and it is good that they not be: variety is a source of wealth and we struggle for everyone to be able to express themselves. The ideal of liberation we advocate is not only economic and social, it encompasses all human dimensions. We live on an island, not a spaceship. Cubans are human beings and, for decades, we could not get in and out of our territory freely. Nor can we now with this recent immigration reform, because in practice the government continues to reserve the right to decide who travels and who does not. It is true that it broadens the time of residence abroad for Cubans and increases the number of travelers, but transfers the difficulty to passport issuance. There are still Cubans who are captives, people segregated: Doctors, professionals, youth of military service age, and others. For them there will be no passport. We will not advance in Cuba while all Cubans cannot leave and enter freely. It is a human right and I fight for it. On the island there are many women involved in the struggle for rights and many others who suffer their deprivation. They and more than 25,000 people have signed their support for the Varela Project, which postulates enshrining into law our right to freedom of speech, press and association, non-existent in this country. The number of signatories is an important success because in Cuba the culture of fear prevails. We are beyond ideologies: our requests are universal; they are not of the right or of the left. I think the efforts made on the island are echoed outside. This year we learned that Uruguayan parliamentarians and also of Norway are officially nominating the Christian Liberation Movement to the Nobel Peace Prize. My father, Oswaldo Payá, was nominated five times before he died and was always said that it would be more just for the nomination to fall on the movement he founded. Receiving this honor would be a great recognition to the cause of freedom and the defense of human rights. The Nobel would help, but our freedom is a problem that we must address ourselves in Cuba, with the tools of personal effort and, above all, determination. "I have seen evil up close, but if I didn’t have faith, my fight for the rights and values of my father, would be more bitter". "My dad died in a car crash. (...) He’d spent a long time receiving threats, "says Rosa. TR @RoderickNavarro We have jailed students across the country, pursued and intimidated at home youth leaders for nonviolent protest ... You can not pass under injustice with silence. TR @DiegoScharifker These irresponsible ones are plunging the country into a political & institutional crisis. Venezuela is not your estate! TR @RoderickNavarro In Castillejo #Guatire Chavista thugs launch rockets to the houses of developments that bang pots and pans in protest! "Venezuela is not a democracy. Power has been concentrated for more than a decade into the hands of Hugo Chavez, his political party and Cuban handlers. The judiciary and the Congress were subordinated to Hugo Chavez. What you have had in Venezuela today is a contested elections in a non-democratic country. If Capriles is able to take power then the hard work begins to rebuild Venezuelan democracy and if Chavez is victorious the struggle to begin a democratic transition continues." — Government supporters forced Capriles’ observers out of 283 polling places, threatening them with guns in some instances. There were 722,983 votes cast in those polling places, and the lack of witnesses allowed the possibility of fraud, including double-voting. — Government backers on motorcycles, traveling in menacing packs, turned pro-Capriles voters away from the polls. — There were 3,535 damaged voting machines, representing 189,982 votes. — Voting rolls included 600,000 dead people. — An unspecified number of votes were recorded for people whose official birth dates would make them 100 to 120 years old. — In 1,176 of the 39,319 voting machines, Maduro got more votes than Chavez had in the October presidential election even though Chavez was far more popular and won nationally by a far bigger margin. 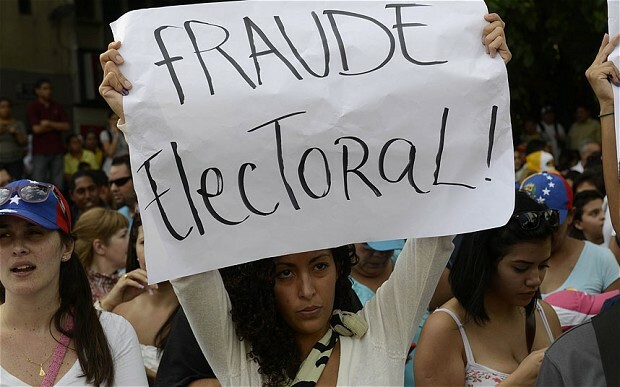 — Maduro supporters held get-out-the vote campaigns at 421 polling stations in violation of election laws prohibiting partisan material at voting centers. The National Electoral Council and the courts are dominated by Chavista loyalists and are almost certain to reject Capriles’ push for a recount. Furthermore, the reaction of the Chavista regime to nonviolent demonstrators and the violence visited upon them for wanting to demand a recount contrasts powerfully with the 2006 Mexico elections. Hundreds of thousands of Mexicans were able to nonviolently protest the election results and demand a recount. Why does the present government threaten violence against nonviolent protesters exercising their rights? Because Venezuela is on its way to becoming another Cuba where human right are systematically repressed. In addition, Venezuela has been at the forefront of undermining regional human rights bodies. The Cuban presence in Venezuela and the impact of the Castro regime and its coordination with the Chavez-Maduro government has been profound. Now is the time for all people of good will to maintain their vigilance with regards to events in Venezuela and the plight of the nonviolent, democratic opposition. In Cuba, the democratic opposition has organized nationwide pots and pan protests in solidarity with the Venezuelan opposition. They are also suffering tonight acts of repudiation and violence by a brutal regime. Time to pray for Venezuela and to engage Venezuelans with solidarity in order to defend democratic and nonviolent values. Time is running out. With my mother and my two brothers, Oswaldo, 25, and Reinaldo, 21, we live in one of the oldest, populated and humble neighborhoods of Havana. We are very normal, with the privilege of having an exceptional father that, at age 17, finished his high school at night while during the day he broke stones in the quarries of forced labor, the punishment imposed on him for going to church. We have never complained about lack of material needs because there are some living worse, especially in rural areas. We shop at the same markets stocked as the others. An average salary in Havana fluctuates between 15 and 20 dollars a month, but a bottle of oil costs two. A kilo of detergent, three dollars and a mop, a dollar. In my house we live only on the pension that my mom receives for the death of our father and the help of our relatives living abroad. My mom is an engineer, and I graduated in Physics. My younger brother is a student. I studied Sciences after discarding Law, because science seemed more difficult to manipulate. Thus, the Lenin quotes also appeared in the prefaces of my books, but I learned the same differential equations that are taught at Berkeley. I don’t have a job, because the government took advantage that I was transferring from the Institute of Astronomy to a research institute at the University of Havana and pressured to refuse me entry. I love science, but also the humanities and in the future, I would like to dedicate time to them. Studying makes me happy. I lament that I could not go to Chile, a diploma in public administration and political theory at Miguel de Cervantes University interests me because it is ambitious. Chileans are a people who I respect and admire and Cubans can learn from their reconciliation process. But I could not travel. Those are the costs of living and struggling in Cuba. In my family we have a Volkswagen car from 1964 and we consider ourselves very fortunate. A car is a rather prohibitive on the island, except for the hundreds of Fords or Oldsmobiles from the 1950s that are circulating and polluting. I move on bus (micro) or Cuban taxi, the race costs between 5 cents and half dollar. Public transport, although it has improved since my childhood, is bad: at peak times it is difficult to take and bus stop schedules are not met. But the youth, we battle the deficiencies. The Cuban people are, by nature, gregarious and cheerful, and that helps the climate. Young people love to get together in the evenings to talk, smoke, sing, and laugh or just to be, to spend time. I love going out with my friends, but I have had very little time since my father died. In Havana there are some pubs and clubs, but we hardly frequent them because they are little varied and very expensive. The young cultivate our own way to have fun, a simple way, without money. Each night we gather around the boardwalk (malecón) and on G Street, a major thoroughfare whose central splitter is a large park. There the young gather, there is joy when you share with friends. Cubans are the model of what the imagination combined with the lack of options can achieve. So we, the young, have taken areas of the city. But we also know that to sit in a café, dress with illusion, or talk in a bar, the opportunities in my country are very few or are beyond our reach. Once we were with my family on vacation to Varadero and stayed at the village church, because we know the priests. My only exceptional trip was in 2008, when I went to Poland invited by a group of young Catholics, I spent three days in Rome and some days in Madrid to see my family. It is true that education and health in Cuba are public, but would Chilean students change their voting rights, freedom of expression, freedom of enterprise and their right to leave and enter the country freely for free higher education? I think not. In public health there are also no miracles: when a surgeon should go out to operate on bicycle while at the same time building with his own hands a house for his family, and the salary is not enough, the patients end up paying the consequences, no matter the good that doctor may have. For young Cubans it is very frustrating to live in a place that is offline, as if living at a different time on the planet. There are prohibitions against having internet at home, those who do have received special permission from the government, or they violate the law. Network communication is censored: there are many pages that cannot be accessed and at universities and workplaces internet access is monitored and censored. Because of this the Christian Liberation Movement, of which I am the public face of since my father died, and other opposition organizations promote the Heredia Project today, a project that requires, among other things, the right to free internet access, e mail, telephone, satellite television and cable.